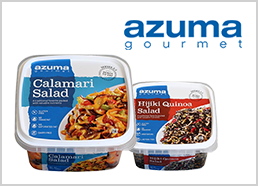 azumagourmet | BRAND Category | Azuma Foods International Inc., U.S.A. The thoughtfully developed and highly anticipated azumagourmet® products are available at a supermarket near you. azumagourmet® products are ready-to-eat either refrigerated or frozen. These Asian-inspired products were created specifically for retailers to meet customers’ dietary needs and demands. All products meet or exceed FDA standards and are produced solely in the U.S.